This research proposal aims at performing a series of shaking-table tests on a full-scale flat-bottom manufactured steel silo filled with a granular material to investigate the actions provoked by the granular solid onto the silo wall under earthquake input. Two different base conditions will be investigated: (1) fully restrained and (2) seismically isolated. 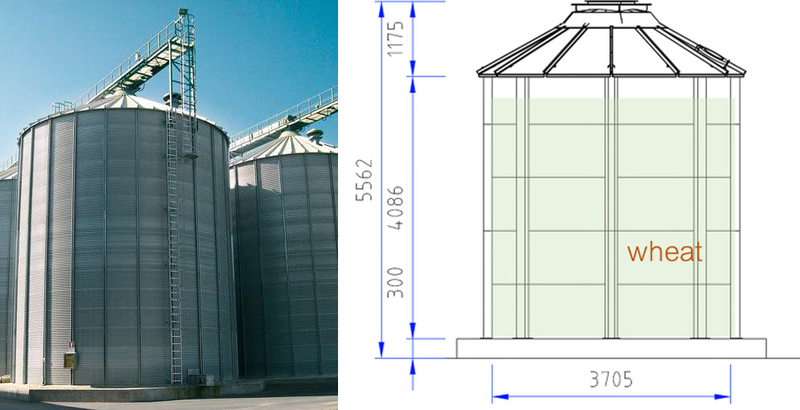 Current seismic design recommendations for silo structures (e.g. EN 1998-4) are based on approximate quasi-static, and often overly conservative, assumptions as a consequence of the widespread lack of experimental investigations on the seismic response of real silos. Therefore, significant advancements in the knowledge of the structural behaviour of silo structures are still necessary. Recently, researchers of the proposing team (Silvestri et al. 2012) developed an analytical model for the estimation of the maximum horizontal pressures exerted by the ensiled material to a cylindrical element under earthquake excitation. The findings indicated that, in the case of squat silos characterized by low, but usual, height/diameter aspect ratios, the portion of the grain mass that interacts with the silo walls (e.g. the effective mass) turns out to be noticeably smaller than both the total mass of the grain in the silo and the effective mass suggested by EN 1998-4 for design purposes. This analytical model has so far been validated only on shaking-table tests conducted on small-scale Plexiglas cylindrical specimens, albeit with very encouraging results. The main objectives of the tests are: (i) the identification of the basic dynamic properties (period of vibration, damping ratio, amplification) of the grain-silo system, (ii) the experimental verification of the analytical theory proposed by Silvestri et al. in 2012 on actual silos, for possible future implementation into structural design procedures, and (iii) the assessment of the benefits obtained introducing a isolation system at the base of the silo.